When it comes to fresh Mexican fare on a budget, it’s hard to beat the diverse and delicious Flaming Amy’s Burrito Barn. This collegiate favorite that’s found along busy Oleander Drive has a cult following thanks to overstuffed burritos, unique flavors, and a locally famous salsa bar. The menu is extensive, and is divided into salads, quesadillas, chips and dips, nachos, and soft tacos, and of course, Amy’s signature burritos. There are well more than a dozen burrito varieties alone, which range from the classic to the perfectly unique, and every visit to Flaming Amy’s presents a new opportunity to try something new. Distinctive options include the Baywatch, with grilled tilapia, shrimp, and the house-made Hasslehoff jalapeno tartar sauce, the Big Fat Greek with black olives, spinach and feta, and the Philly Phatboy with steak, grilled peppers and onions, mushrooms, and sour cream. Every visit to Flaming Amy’s must be complimented with multiple trips to the extensive salsa bar, which includes traditional varieties like red salsa and salsa verde, and more unique creations like fresh mango salsa. 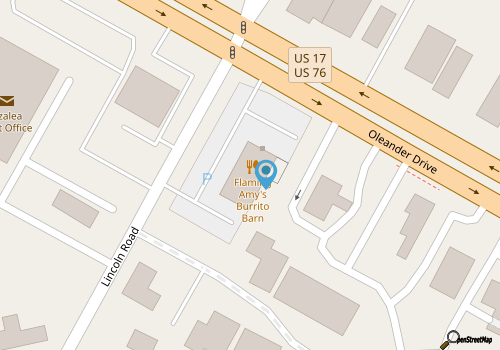 Delicious for UNCW students and food connoisseurs alike, Flaming Amy’s Burrito Barn shows no signs of shedding its reputation is the best place to go for fast, filling and undeniably unique Mexican cuisine.